100ft UL rated BNC Cable. UL rated for safe in-wall construction. 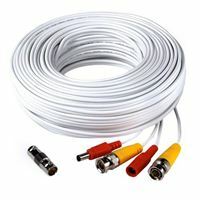 Easy-to-connect coax extension for security cameras. Tight locking, secure, and can't accidentally disconnect. 75ohm, double shielded, and weather resistant to withstand harsh conditions. Send power to your camera thru the same cable.